Looking for the best houses for sale in Miami Beach? If you’re looking for the best houses for sale in Miami Beach, you should look for something that provides a unique living experience and stands out from the rest. These three homes offer something different and are great examples of luxury living in Miami Beach. Each have their own luxurious view and outdoor living areas as well as spacious interiors to accommodate any lifestyle. This house for sale in Miami Beach is one of the best for the highly sought after downtown southwest sunset views. This home was built with entertaining in mind, especially in the main living areas. The central part of the home is very open and has great flow to and from the four separate outdoor entertainment areas. The backyard and pool have a great combination of pool, lounge areas and balconies, all overlooking the magnificent view. The master suite has plenty of space to relax and unwind as well as get much needed rest, and the spa-like bathroom provides a tranquil place to decompress. This house for sale in Miami Beach is an amazing property that feels like a Bali retreat. On the northeast end of Dilido Island is a spectacular Mediterranean inspired house for sale in Miami Beach. This home is best for it’s wide views of the Venetians as well as the architecture designed by the well-known Ramon Pacheco. The living areas are very open and elegant, with room to entertain both formally and informally. There are many wide windows throughout, showcasing the view. The kitchen is well lit and a great place to cook as well as spend a morning relaxing. The backyard has a great resort style pool and spa with an amazing view of the water and city. This house for sale in Miami Beach merges old and new for a luxurious living experience. For those looking for a modern house for sale in Miami Beach, this is a great option. The backyard has an amazing view with a secluded pool and lounge area. This space is very intimate and private, feeling like a personal resort or spa. There is a second floor balcony overlooking the yard and water, adding more private space for relaxing. Inside the intimacy continues with bright rooms and great natural light. This house for sale in Miami Beach is ideal for entertaining, showing off the outdoor space, and acting as your own private resort right on the water. This entry was posted in Miami waterfront real estate and tagged Miami luxury homes for sale, Miami Real Estate, Pobiak Properties on May 10, 2017 by Giancarlo Bobbio. These three waterfront homes for sale in Miami, Florida are a few of my favorites because of their vastly unique exteriors and individual takes on a white color scheme inside. Each home has its own charms from backyard swimming pools, gorgeous waterfront views, to luxury master suites, and spacious living quarters. This collection of homes showcases the variety of waterfront homes for sale in Miami, Florida and represents the luxury lifestyle available currently on the market. 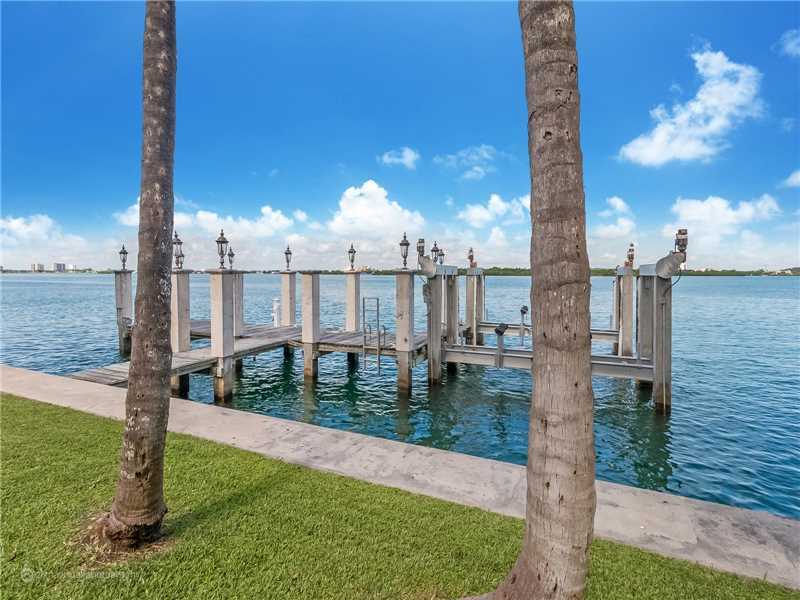 The first of the waterfront homes for sale in Miami, Florida that became a fast favorite was this property in Coconut Grove. The exterior is sleek and modern with an amazing view of the water and city. I especially love the simple backyard. The pool is so inviting and the clean lines make the view and surrounding foliage stand out. The lush front yard adds some natural privacy and mystery to the property. Inside there’s a great neutral white color scheme which provides a very minimal esthetic or a blank canvas for the new resident. The main living spaces have great wide windows that look out over the water and even have a view of the city beyond. The wood finish accents tie the whole home together and make for a very modern and luxurious waterfront home for sale in Miami, Florida. This waterfront home for sale in Miami, Florida has an exterior that immediately caught my eye. The Hamptons style design says classic lake house and is a unique find among all the waterfront Miami real estate. There is a large lush backyard paired with a wonderful pool and pool house which could also function as a guest house. Beyond this simple outdoor space is an almost perfect view of the lake and island. The interior is very open and has a modern feel with all white walls and darker wood accents throughout. There is plenty of space for hosting guests or parties, as well as room for spending time with the family or relaxing. Along with the minimal esthetic there are luxury accents in the kitchen, bathroom, and the guest house. 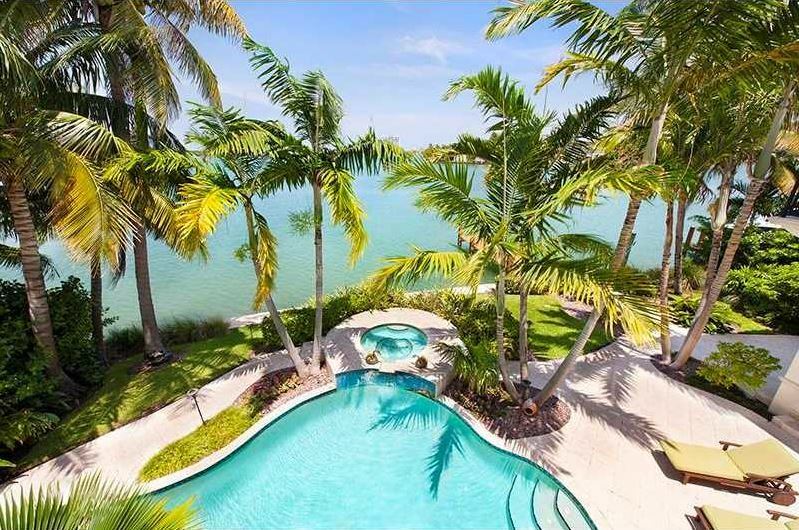 This home is a favorite among all the waterfront homes for sale in Miami, Florida. A third favorite from the current waterfront homes for sale in Miami, Florida is this magnificently stylish waterfront residence. The exterior is just beautiful and has a very old world feel. The landscaping and statues throughout the backyard are unique design elements that add to the ambiance. Arches are prominent throughout the home, creating a cohesive design. Other outdoor features include an impressive dock and lush landscaping. The beauty of this property continues inside with twin staircases framing the foyer. There is gorgeous marble work throughout and large windows drawing the view inside. Some of my favorite accents include the large fireplace, the wood and stone in the kitchen, and palms view in the master bedroom. This home is luxurious in every way and is a marvel of all the waterfront homes for sale in Miami, Florida. This entry was posted in Miami waterfront homes, Miami waterfront real estate and tagged Miami Real Estate, Miami Waterfront Homes, Miami Waterfront Real estate, Pobiak Properties on March 27, 2017 by Giancarlo Bobbio.